Thunk. The sound of Jane Esperson's comic-tragedy landing slam bang in the middle of the final ten episodes of the series. With just five episodes to go, Esperson's episode comes across as a squeal of brakes and, instead of ratcheting up the tension from the previous four weeks, she opts to make the inevitable Ellen - Saul - Caprica love triangle the tent pole of the narrative. And Ellen is back to her old ways, the bitchy selfish manipulator we all knew and loved. Maybe Cavil has good reason to kick back at this particular member of the Final Five because she does nothing to endear herself to the audience here. It was certainly a case of 'mother knows best' as Ellen swans in and throws her weight about, splits the Final Five and throws Saul Tigh into a tizzy. From mother of the Cylons to whore of the fleet, the personality change she undergoes is rather frightening. The other moments of comedy gold are apportioned out to the return of Gaius Baltar. He returns to his harem only to find that they've all got along without him pretty well, managing to trade for food and establish friendly relations with the rest of the ship. Their figurehead, Paula, has even managed to arm them to protect them from the violent raids from the Sons Of Aries. James Callis is charming and funny as ever as Baltar, another arch manipulator of course, and with religious fervour out of the window he decides to rely on his cult of personality to impress the ladies once again, almost going to the extent of kissing babies. The invisible Six reappears and effectively writes his speeches for him and goads him on into convincing a befuddled Adama that the threat of revolution is real and to hand over weapons to the group. Adama's really lost it if he lets the silver-tongued Baltar convince him thus. So, after promising to feed everyone and suggesting to a Cylon ambivalent Adama he is the 'last human solution' to keeping together a disaffected fleet, lots of guns are doled out. Keep an eye on Paula, I say. 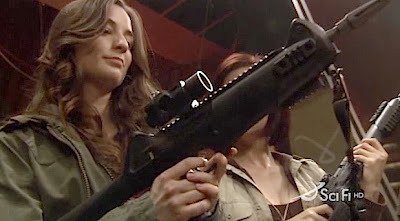 She's hungry for power and was cradling that very big gun rather too enthusiastically for my liking. And I loved the physical comedy of Baltar not knowing one end of a gun from the other. The death of Six's baby Liam is in stark, tragic counterpoint to the Ellen and Baltar 'comedy of errors'. It all comes crashing down very depressingly even though this resolution to the situation does seem rather throwaway and is almost a too convenient way to end the pregant Six plotline. How does this now square with the plans of the Final Five? Oh, it's OK, they've still got Hera, after all. And I'm guessing Ellen isn't going to be flavour of the month with Tigh after her tirade of abuse seemingly triggered the complications of the pregnancy. And as baby Liam dies, suddenly Anders EEG sparks into life. Has there been some sort of transference? Will Anders recover and will we get more exposition? Where's Starbuck? Will Cavil catch up with the fleet? Will there be a Baltar and Paula revolution? C'mon, there are only five episodes left!